Saturday 3rd June – Sunday 4th June 2017. Weekend trip to Mae Sariang. 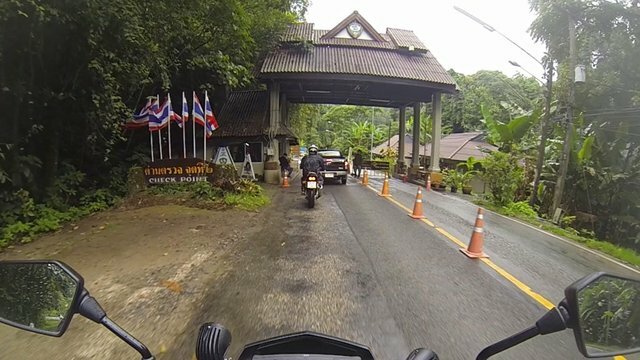 Day 1: Chiang Mai > Mae Chaem > Khun Yuam > Mai Sariang. Meeting at a local PTT garage, 5 of us gathered to ride to Mae Sariang. The group consisted of 3 lady riders, and 2 male. 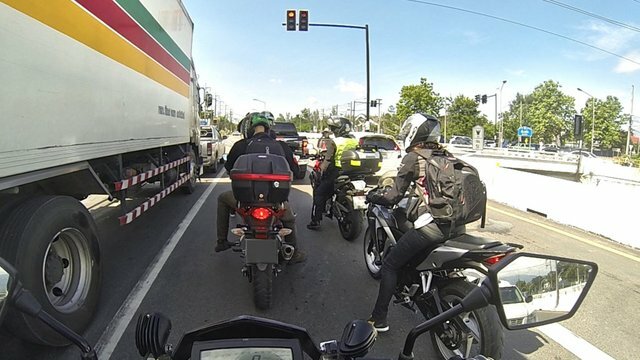 My friend Sam (lady) on her CB500x, Ms.S on her CBR250, Mr.K on a CBR300 and Mr.B on his CB400. I go and break the Honda theme by riding my Kawasaki dtracker 250. Haha! We set off along the straight and monotonous route 121 and 3035, south. For me this road (and roads like it) is my idea of rider road hell, due to the long straight boring stretches. (Ok, “rider road hell” might be a touch extreme, but honestly if all roads were like this around me, i would never ride). After what felt like forever, we turned left onto the 1013, which although initially is a touch boring, eventually things do start to get interesting. By now I was chewing at the bit to ride twists, and like a dog with rabies i was foaming at the mouth at the sight of the first curve. 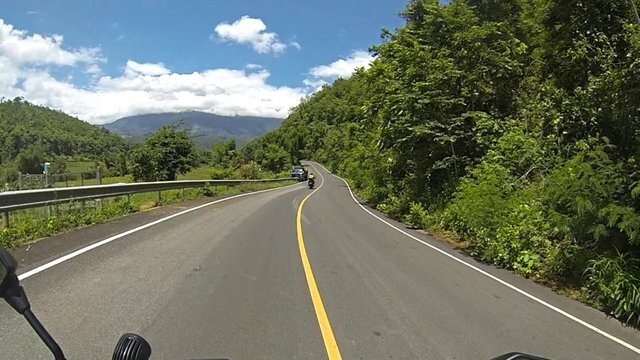 The moment of pure unadulterated joy hit after the second Doi Inthanon checkpoint, when we headed on to the 1192 to Mae Chaem. Oh GLORIOUS beautiful scenic road that you are! 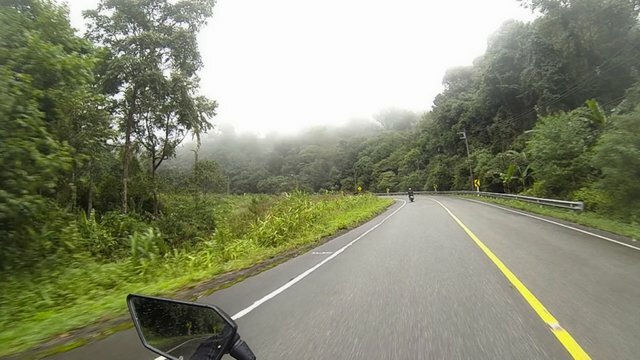 I was in 7th heaven, riding through the mist and rain sprinkled national park forestry. The real beauty of Thailand’s nature passed us by with every twist and turn. Every cell in my body began to feel alive and my skin prickled with excitement. Mr.B was the fastest on his CB400. I believe I gave him a decent run for his money when we hit tighter twists though, but that would only be right for him to say rather than me ;). The tight twists are my forte’ and this is where I can out-ride a number of riders, but of course not all! I enjoyed having someone to chase, although not always good risk-wise, but that’s the gamble we choose to take. Thankfully no incidents. Miss Sam kept a steady fast pace on her CB500x as usual and Ms S was fast on her CBR. 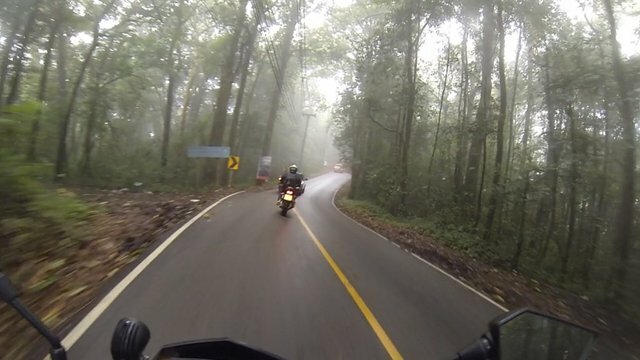 Mr.K, being new rider, was testing his mettle on these roads. He kept great pace. 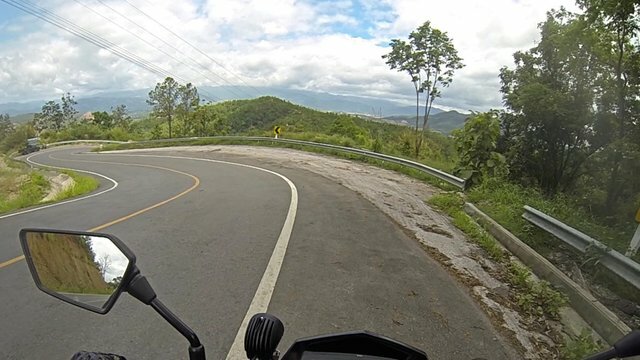 Nearing Mae Chaem I got onto some nice twisty sections so was able to get ahead. 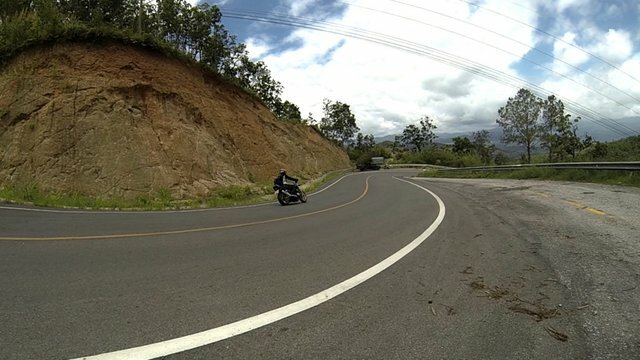 This was an advantage in that I could park up and ready myself to capture the riders coming down a glorious twisty section of road. 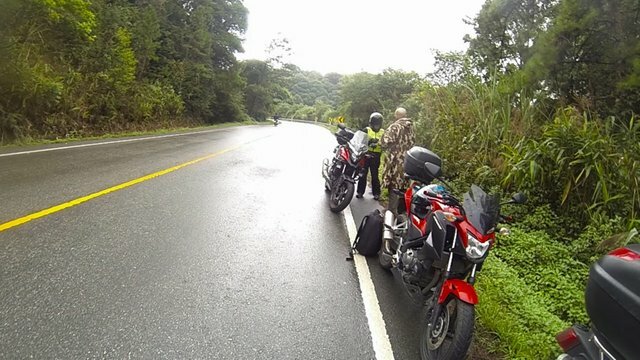 I caught a nice gopro video of the riders coming down this stretch, except for Mr.K, which turned out to be a good thing really, for I couldn’t start my bike up and he rode by and saw me struggling. In the end I rolled my bike down the twists until i could get my girl (my bike is a girl ^^) started. Reason for my bike not starting? RIDER ERROR! That’s why! I forgot to check the coolant and my bike overheated. Gah! Was able to get this sorted out at Mae Chaem though and thankfully no more issues after that. At Mae Chaem Miss Sam and I split off from the other three riders, choosing instead to ride the longer way to Mae Sariang via Khun Yuam. I knew this route would be a mental challenge for me due the fact I would be riding past the site of my previous bad accident zone. I have only ridden on this route once since my accident and have actively avoided it. One should face ones fears though, so knew it would be good for me to ride through. Tougher than I expected though as my chest tightened and my breathing became shallow when approaching the general area of the accident. I kept having visions of me falling and every odd little water puddle seemed to look like pools of blood (sorry to sound morbid, but this is what was going through my head). I felt faint at times, uncomfortably so. I made some odd pained sounds inside my helmet that came from nowhere and felt odd. Basically I was riding for a very long time whilst having a minor panic attack. At one point I beeped at my mate Sam and asked her to pull over for a moment. Explained that I just needed a moment to clear my head. 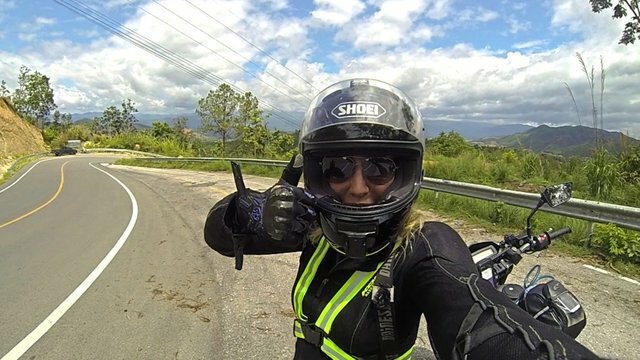 She was great about it, and after a chat and a much needed laugh about life in general I was able to get back on the bike and ride through with the images having faded away. 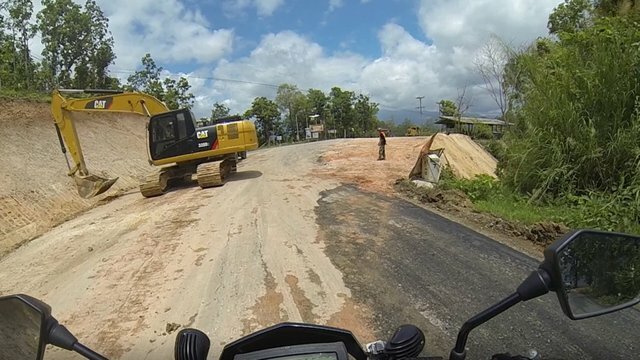 Riding through the road I saw large sections being resurfaced. Was good to see this road getting some work done on it. Even though it had already been resurfaced a few years back (when I had my accident it was very broken up), potholes and cracks were popping up all over again. This road is a real hazard in areas. On route we bumped into a tourist couple riding separate scooters, wearing the bare minimal. Sam pulled over to say hi to them and I pulled up behind her. I didn’t catch what she said at first but I gather she was warning about the road surface and pot holes. We said a few friendly hellos and gave well wishes. Nice couple. You don’t normally see this road with tourists riding along it. I hope they had a fun and safe adventure. At one point we passed through a stunning area FILLED with yellow butterflies. FILLED! I slowed down to appreciate the sight of them, and also to try avoid squishing them. End up feeling like a murderer. 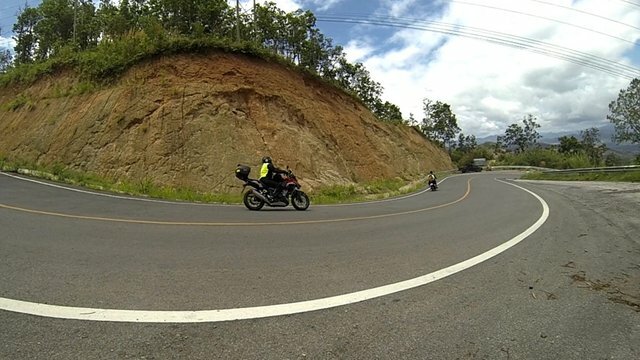 I was able to capture some of this sight on my gopro (video at the end of the write up), but it doesn’t do the moment justice. Arriving finally at Khun Yuam we headed to the petrol station where I fueled up and we enjoyed a bottle of coconut water each (natures electrolyte!). I think we were a mild curiosity there. I was able to get one girl to take a couple of photos of us. Nice to collect a few memories, even though the best ones are lodged in the brain memory banks. Feeling refreshed we headed on the 108 to Mae Sariang. A pretty stretch of highway which became hazardous at one point when the rains came hammering down. Rained so badly our vision was pretty much impossible and so we rode at a crawl. A little scary to be honest and if it had not have eased off we would have had to pull over. 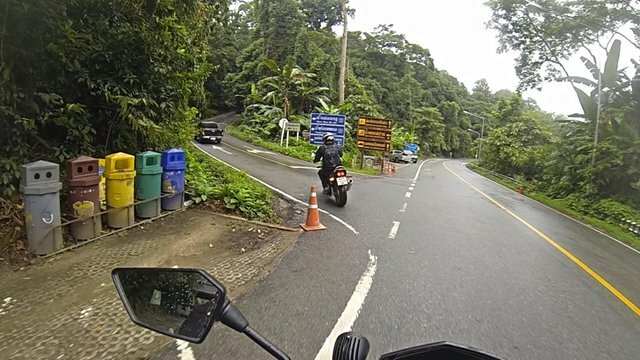 The thing with riding during rainy season in Thailand is that you learn that often rain just comes down in one spot only. Or, will pass through quite quickly. If you stay in one spot and wait for the rain to die down or pass, you might have to wait quite a while. However, if you can slowly keep going, chances are it will be gone by a few kms. Its odd like that really. At around 4:30 / 5pm we arrived in Mae Sariang and headed straight to Above the Sea guesthouse, where the others were already lounging by the pool. The guesthouse is owned by a rider, who has an interesting bike collection. A nice guy with a quirky and beautiful resort (ie: door handles are made from garden tools. Creative touches like that). We dumped our things in the room. got cleaned up and headed to cool down in the pool. Usually during low season in Thailand most accommodation will have reduced rates, which included Above the Sea guesthouse. The price on Agoda.com was 700 baht including breakfast. The price will be a little higher if booked directly with the hotel. Above the Sea has a bar and restaurant and you can eat and drink poolside as well. Expect to pay higher prices during high season (November to February). Mae Sariang itself is a great town. Quiet, but fun. We ate some fantastic food in the restaurant hotel opposite from Above the Sea and a while later another rider the group knew came to join us (who would be riding with us back to Chiang Mai the next day). After a long chat over dinner we headed on to Ching Ching Cafe. 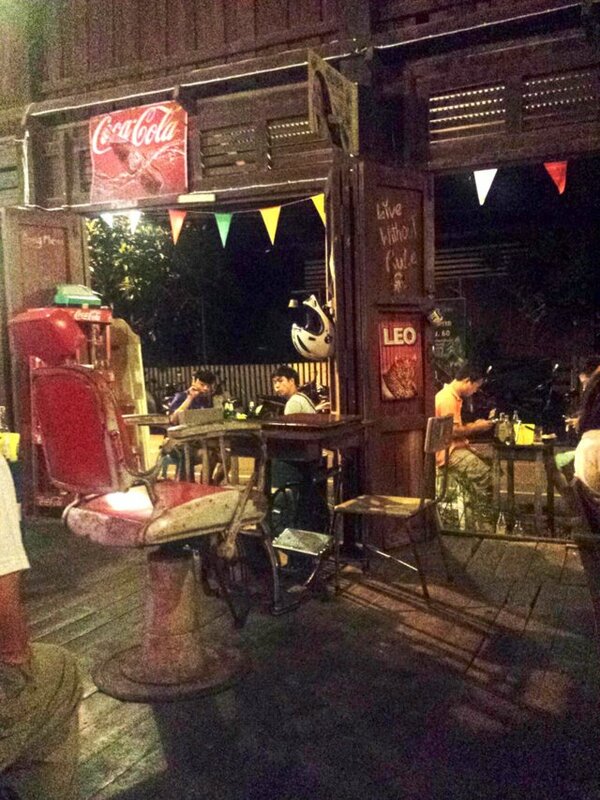 Ching Ching is a popular hangout and has interesting decor, such as barber seats and old signs. Feeling tired although still fairly early, I called it a night and returned to the room. The beds were very comfortable and I slept well (albeit not enough as I woke very early and decided to get up and take a wander). 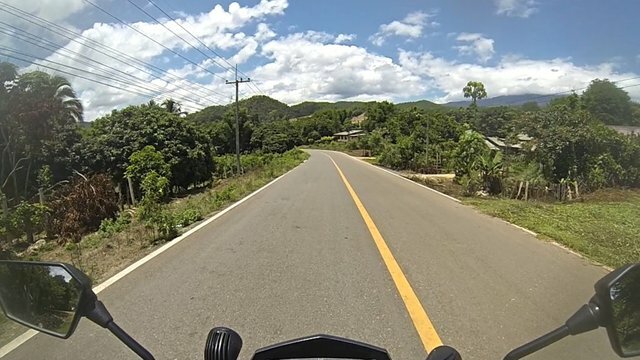 Day 2: Mae Sariang > Chiang Mai (via Hot). Mr.G being the new addition, with yet another Honda CB250 on the scene. What’s with this Honda group thing? …haha! At around 9am we all regrouped over breakfast (breakfast is included in the price at Above the Sea). We discussed possible routes. 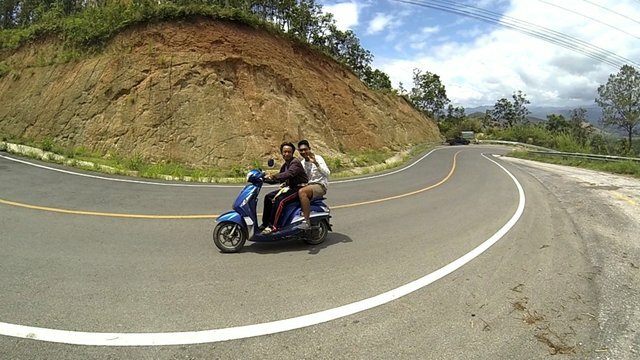 The majority of the group wanted to head straight back to Chiang Mai along the fastest route. I am not a huge fan of this route to be honest, as i find it a little too sweeping with not enough twists. On a bike with more power I am sure it would be more fun, but on my dtracker it is a bit of a slog. The consolation was that Miss Sam had the idea of taking a detour to Om Koi. Seeing as neither of us had ever been to Om Koi and we had heard good things, this was an exciting prospect and worth taking the road for. We geared up and headed off by around 10am. We rode at speed along this stretch, at times vying for first place. I backed off after a while because I had to push the dtracker too much and was tiring to always keep the throttle engaged so furiously. 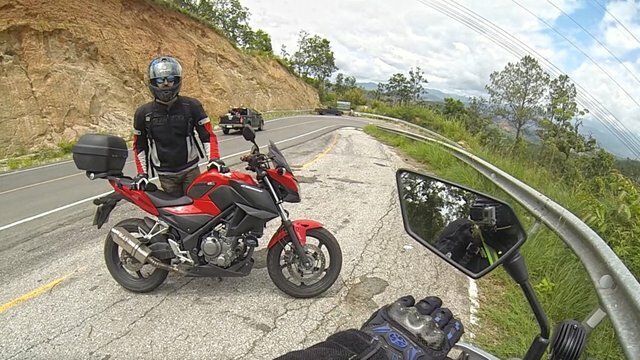 I remember when I rode the MT-07 how smooth these kinds of long sweeping roads felt on a bike more suited to the style of road, but on my dtracker it wasn’t too much fun. Nothing much happened along this road really, aside from the usual vehicle avoidance and overtaking copious amounts of trucks. Arriving at the Om Koi junction Sam looked concerned. She saw dark clouds looming in the distance and I knew instantly that she didn’t want to take the risk of going to Om Koi and getting soaked, or worse, stuck. 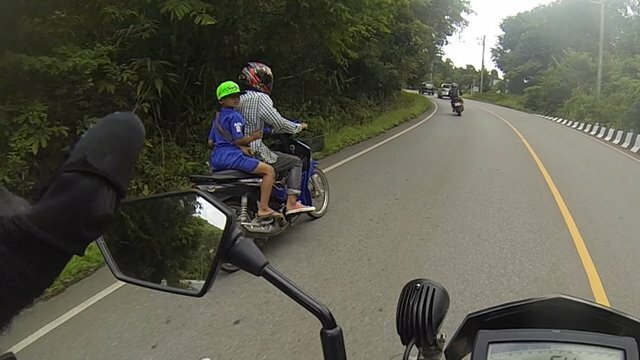 She has a full time job in Chiang Mai, so I understood and although a little disappointed, we struck Om Koi off the list and rode on to Chiang Mai. Seeing as we all knew we would get back to Chiang Mai by lunchtime period, the plan was then to go home, clean up, then all meet for Sunday lunch instead. We continued riding and split ways after a garage fuel up, to head to our respective homes. I confess when I got home and cleaned up and spent time with my crazy monkey cat, the idea of riding into the hot busy city just didn't appeal. 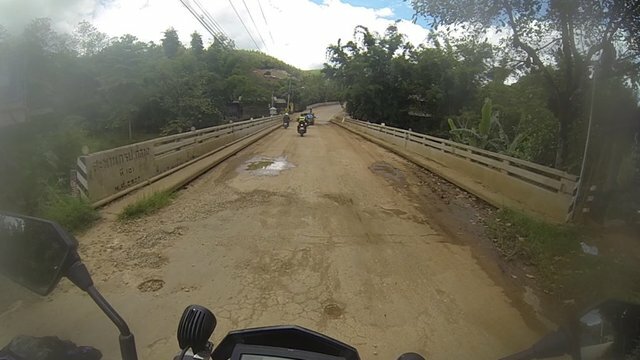 I sent my apologies to the group and worked on video editing the gopro footage from the trip instead. It was a brilliant trip, although the most adventure was to be had on Day 1. 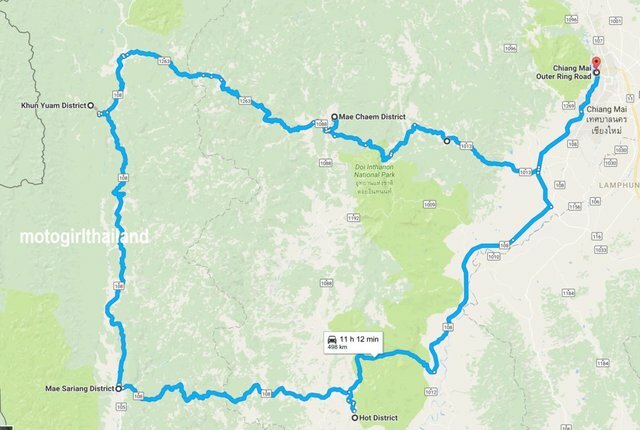 I think in future i will always at least cut through the Hot > Mae Chaem > Chiang Mai route, rather than direct to Chiang Mai. The road section in that area isn’t really my kind of road. I am lucky to know and meet such fun and friendly riders. Fingers crossed things will continue along these lines with the group rides. I come away with great memories and a bigger group of quality friends. Hope you enjoyed this trip report. Great to get feedback and advice ! Seems to have been an interesting tour with lots of fun! A tip: Don't post too much at once. Once a day or even every second day is enough. The more you get known the more people will vote your posts so you want to space your posts. Take a look into Travelfeed if you plan to do more travel posts. Thanks for the tip. Still a learning curve!